The goal of this exercise was simple: recover, track and characterize a real asteroid as if it were likely to collide with Earth. In addition, the exercise was an opportunity to test the International Asteroid Warning Network, which conducts observations of potentially hazardous asteroids, attempts to model their behavior, make predictions, and share these findings with institutions around the world. 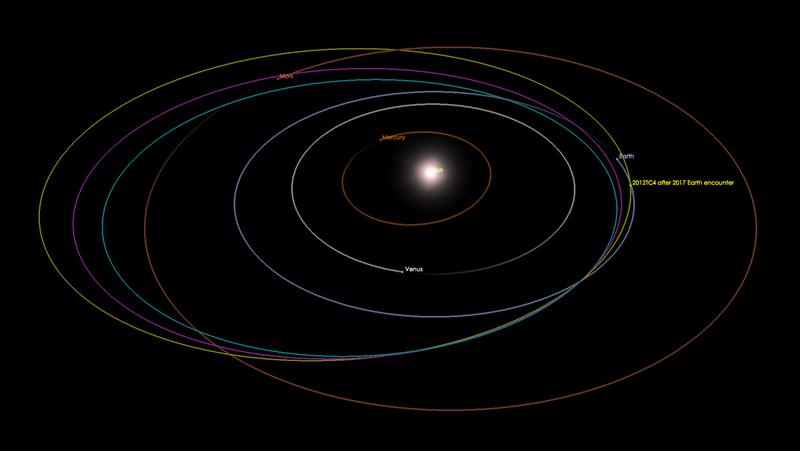 On Oct. 12th, TC4 flew by Earth at roughly 0.11 times the distance between Earth and the Moon. In the months leading up to the flyby, astronomers from the US, Canada, Columbia, Germany, Israel, Italy, Japan, the Netherlands, Russia and South Africa tracked TC4 from the ground. At the same time, space-based telescopes studied the asteroid’s orbit, shape, rotation and composition. What they found that the small asteroid rotated slowly, which was rather surprising. Whereas small asteroids typically rotate very quickly, TC4 had a rotational period of just 12 minutes, and also appeared to be tumbling. Other observations revealed some interesting things about the shape of TC4. These were conducted by astronomers using NASA’s Goldstone Deep Space Network antenna in California, and the National Radio Astronomy Observatory‘s Green Bank Telescope in West Virginia. Their reading helped refine size estimates of the asteroid, indicating that it is elongated and measures approximately 15 meters (50 ft) long and 8 meters (25 feet) wide. Determining TC4’s composition was more challenging. Due to unfavorable weather conditions that coincided with the flyby, instruments like NASA’s Infrared Telescope Facility (IRTF) at the Mauna Kea Observatory in Hawaii were unable to get a good look at the asteroid. However, spectra was obtained on the asteroid that indicated that it has a rocky body, which means it is an S-type asteroids. In addition to the observation campaign, NASA used TC4’s latest flyby as an opportunity to test communications between observatories, as well as the internal messaging and communications system that is currently in place. This network connects various government agencies and the executive branch and would come into play in the event of a predicted impact emergency. In the event that a Near-Earth asteroid might actually pose a threat the Earth, it is good to know that all the tracking, monitoring and alert systems we have in place are in good working order. If we are going to trust the fate of human civilization (and possibly all life on Earth) to an advanced warning system, it just makes sense to have all the bugs worked out beforehand! The TC4 Observation Campaign is sponsored by NASA’s Planetary Defense Coordination Office, which in turn is managed by the Planetary Science Division of the Science Mission Directorate at NASA Headquarters in Washington, D.C.